With April soon ending (how the hell did that happen?!) and May (aka birthday month!!) around the corner, I thought today I’d share a few things I’ve been loving this month. 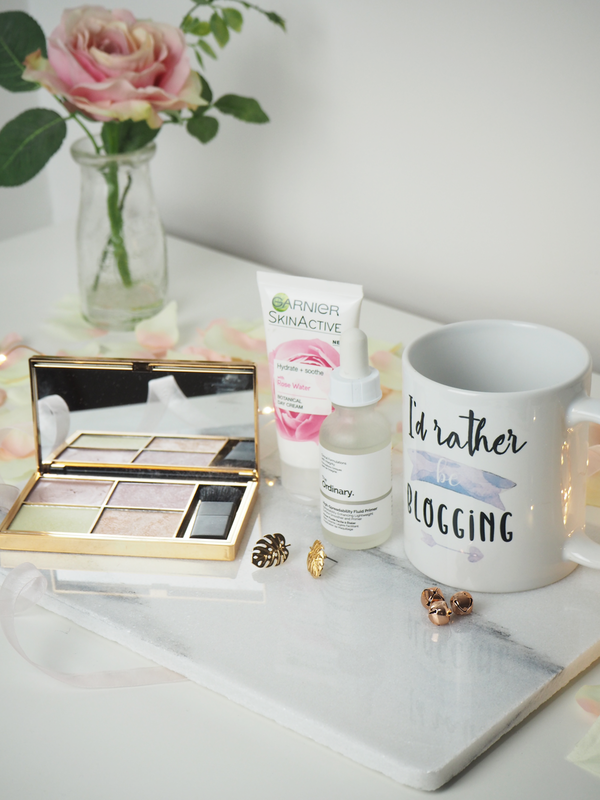 I’m rubbish when it comes to monthly favourites – I tend to use the same thing for months so don’t ever really have enough new products or things to talk about, but for the first time in ages, today I do! First up is this very fitting mug* from blogging mode. This was very kindly gifted to me last month but when I heard about Blogging Mode’s website I did have a scroll through and considered buying myself a mug before they popped into my emails offering to send me one! I’m drinking tea all the time when I’m at home, so this has been the perfect mug for when I’ve been getting my blog business done. At the beginning of this month, I decided to get myself a decent primer. Primer is the one product I barely ever used when applying make-up and I felt like I was missing out. I ended up buying this High-Spreadability Fluid Primer by The Ordinary, and Sleek’s Photo-Loving Primer from ASOS. Being a big fan of The Ordinary products, theirs is the one I’ve been using up first. I’ve been loving it so far – it has a runny consistency which feels a bit oily but soon soaks into the skin, and seems to be keeping my makeup put. A full beauty review will be on my blog soon! A skincare product I’ve been loving this month is Garnier’s Botanical Day Cream with Rose Water. I bought this last month after my holy-grail Clinique moisture surge ran out. With a very sad bank account I couldn’t quite justify another pot so instead picked this up on a whim from Superdrug. It was super cheap – £3 or £4 at most and I’ve been using it every morning before I apply my makeup. It’s really surprised me how much I’ve loved it and will definitely repurchase it as a cheaper alternative to my moisturisers! I feel so late to the party when I talk about the Sleek Solstice Palette. This is a gorgeous quad of highlights – 3 powders and 1 cream. I’ve been using this every day since, all the shades, bar one, are right up my street and they’re really great to work with. Plus, the packaging alone is worth it right?! After my Spring Style Wishlist, I made a cheeky little ASOS order which included these super cute Palm Leaf earrings. I’m a sucker for anything palm print so I nabbed these beauties up right away! My fashion favourite this month without a doubt has to be this tee. After it went out of stock first time round in February I was quick to get it the second time around and I’ve been wearing it ever since. I love the colour yellow and the cute slogan on it, it’s been so easy to chuck on with jeans this month! I couldn’t write an April favourites without mentioning this man. Earlier in the month,h I headed to London O2 to see Sam with my mum and Jamie and boy was it one hell of a show! Despite spending the whole day before in bed with flu and spending the whole concert in a bit of pain it was 100% worth it. We somehow managed to back second row seats which was quite a shock when we realised and Sam just put on the most wonderful show. It was our second time seeing him live and certainly won’t be the last!! That’s the lot for April. With my birthday month coming up, hopefully, I’ll have lots of favourites to come back to you with next month. What have been your favourites of April? *This post contains affiliate links. *This post contains gifted items. "Tips for packing light this Summer"
"Small Actions Matters: 5 ways you can be a little bit kinder to the environment"